If you dine at an Indian restaurant, you're bound to see several saag dishes on the menu. But just what is saag? 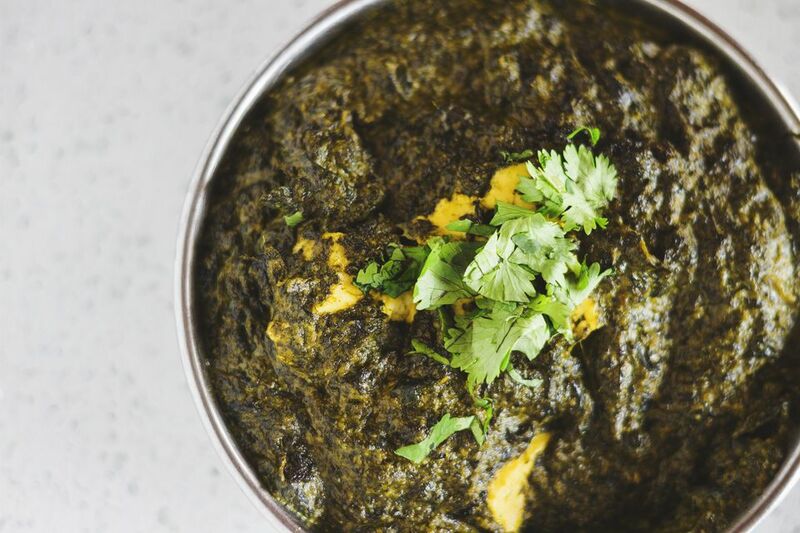 Get the facts on this staple of Indian cuisine with this definition of the food, complete with several examples of saag dishes and their common ingredients. Learn more about the food's roots in India as well. Simply put, the word saag refers to common leafy green vegetables found in the Indian subcontinent (India, Pakistan, Nepal and so forth). When people refer to saag, they do so most often while discussing vegetables such as spinach, fenugreek, mustard greens, collard greens, basella, and dill. These greens are loaded with antioxidants and essential vitamins. Mustard greens, for example, are a great source of vitamins C, A and B-6. They also contain iron, magnesium, and calcium. Saag dishes are said to be most popular in the Punjab region of India as well as in the Northern India regions of Uttar Pradesh and Haryana. It is also frequently served in Nepal. The greens in saag dishes may be chopped fine and cooked. Alternatively, they may be cooked and creamed. Common spices used in saag dishes include cinnamon, cloves, ginger, chili, garlic, coriander, and cumin, among several others. These spices have health benefits such as improving blood circulation. They may even help to ward off infections. Saag dishes are mostly mild with a medium amount of gravy. They go really well with bread like chapatis (a flatbread also known as roti) and naans (leavened flatbread baked in a tandoor or oven). Daals (lentils) are the perfect side dish to order with a saag entree. If you're interested in not only trying a saag dish at a restaurant but also in preparing one yourself, try recipes for dishes such as Sarson ka saag and chicken saagwala. Ask your server for additional details about the dish to find out which spices they use and which kinds of bread best accompany the meal. Tell the server you're interested in making a saag dish for yourself and ask if the restaurant would be willing to share one of its recipes. Many restaurants keep their recipes top secret, while others share their recipes on their websites. In any case, it can't hurt to ask. If the restaurant declines to share its recipe, don't give up. The staff may still be willing to share a few cooking tips, especially if you visit when they're not particularly busy and the cook has more time to speak with customers.